The economy of late has drawn more than the occasional comparison to the Great Depression. And a once stalwart company such as General Motors is looking more like Government Motors these days. Against such a backdrop, I found (and had to add to my collection) a Great Depression-era print ad for a General Motors product--a 1934 Chevrolet Master Six Sedan. 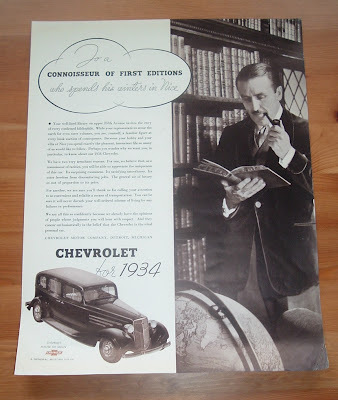 The kicker for me, and the reason for this post, is that Chevrolet used a bibliophile to represent its target audience for the ad. 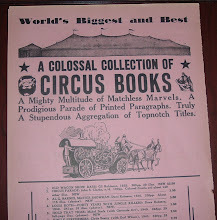 Most unusual, to say the least, and quite interesting to a bibliophile in tough economic times 75 years later. Chevrolet, along with other auto makers, was undoubtedly struggling in 1934--smack dab in the middle of the Great Depression. 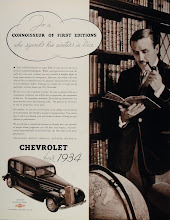 The ad campaign above decided to go after those who still had some disposable income and try to persuade them to lower their standards (my interpretation) and spend their money on a more economical model--the Chevrolet Master Six Sedan. This bibliophile is no car connoisseur, but when I look at the picture of this vintage automobile, I see a cool-looking classic. I lump most old cars into that category. But in 1934, the Chevy Master Six Sedan may have been the equivalent of today's Chevy Malibu. An okay car, sure, but no self-respecting, wealthy bibliophile would be seen driving one, right? Especially one who winters in Nice, France! Your well-lined library on upper Fifth Avenue invites the envy of every confirmed bibliophile. While your representatives scour the earth for even rarer volumes, you are, yourself, a familiar figure at every book auction of consequence. Between your hobby and your villa at Nice you spend exactly the pleasant, insouciant life so many of us would like to follow. 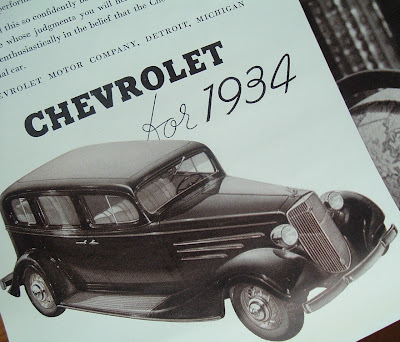 Perhaps you wonder why we want you, in particular, to know about our 1934 Chevrolet. There's more about the attributes of the new Chevy and the flimsy reasons why the super-rich might want to ditch the Rolls Royce and experience the ride of the common man. But what an introduction for a car ad! I have no idea how effective the ad was, but it's a nice relic from the ad world of long ago. 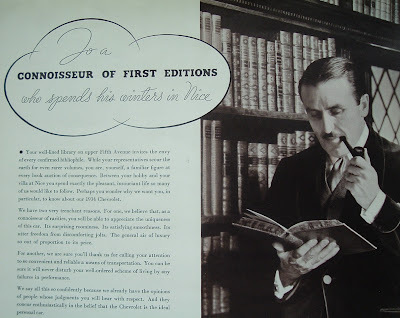 And maybe it was the first and only car ad to feature a bibliophile. And I'd bet it was also the first and last ad to use the word insouciant to sell a car! You won't need a ticket to get into the American Bookbinders Museum Web site, but you will find plenty of tickets once you are there. A bookbinder's ticket is actually a small, printed label that advertises the bookbinder's business and craftsmanship in the work the reader is holding. The example above is from a Dutch collector who recently emailed me some scanned samples, which I featured in a recent post here. The bookbinder is identified by name and, most always, location, and there may be additional information about the business. This information may be presented with accompanying decorative graphics or in just a plain vanilla style. The label, or ticket (the two terms are often used interchangeably), is typically affixed to one of the endpapers. I tend to find more on the rear endpaper, but the front endpaper is certainly no stranger to these tiny collectibles. These are typically found in older books (say mid-twentieth century and earlier) when the practice of affixing these minuscule advertisements was more common. 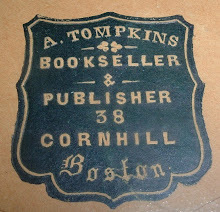 Labels for booksellers are more often found in old books than are the tiny ads for the bookbinder. At least, that’s been my experience. So I was very interested to learn recently of a site that features bookbinders’ tickets. 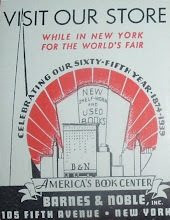 Re-reading the Exile Bibliophile’s March 7th post earlier this year on the Fine Books & Collectibles Magazine blog, I found a follow-up comment that mentioned The American Bookbinder’s Museum and their collection of some 500 bookbinder tickets. Just use the link above to go to the museum’s Web site and click on the Bookbinders tab, and then the With Images tab. Or click the link at the beginning of this post. Either way, scroll down and view an alphabetical listing of these interesting little artifacts of the book trade. You just might be inspired to search the older books on your shelves for these hidden nuggets of bibliographical history. 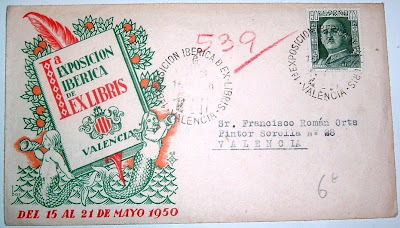 I have here two bookplate-related postal covers (bibliophilately) advertising an exhibition of ex-libris or bookplate art, I would suppose, in Valencia, Spain, the week of May 15-21, 1950. 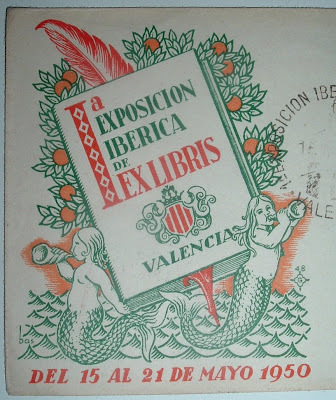 I cannot find anything on this exposition/exhibition, nor can I find anything on the addressee. Another clue is in the illustration of the bookplate on the first cover (zoomed-in shot below). The name Juan Carsi y Figueras is the owner name depicted on the plate. That lead dead-ends quickly. 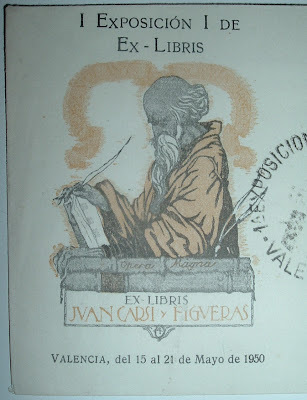 Perhaps the Bookplate Junkie can shed some light on this Exposicion. I didn't want to wait to find out the story behind these covers. They are too unique, interesting, and attractive not to share now. With Cuba in the news recently, as the Obama administration lifts certain restrictions and explores lifting others, here is a topical piece of bibliophemera from my collection--a 1943 cover from the Swan American Bookstore in Havana, Cuba. The Swan American Bookstore, as the name would imply, stocked only American books printed in English. If you were looking for a Spanish language book here in 1943, lo siento, pero todos los libros son en Ingles. The bookstore was still in business in 1949 and was referenced in a 1949 St. Petersburg Times article about bookstores in Havana. Obispo sounds like it was the street to do business on. According to the article, "Calle Obispo is a narrow, busy street as full of bookstores as Central Avenue is of fruit stands in the tourist season." The environment along the street amid shopkeepers and book browsers appears to have been laid back: "Proprietors and clerks don’t mind if customers stand around reading their books." 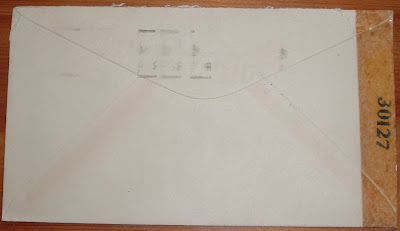 Six years earlier during World War II, however, attitudes ran counter to "laid back," as evidenced by the "EXAMINED BY" adhesive tape running along the left edge of the envelope. A bit of censored postal history in concert with the bibliophemera. 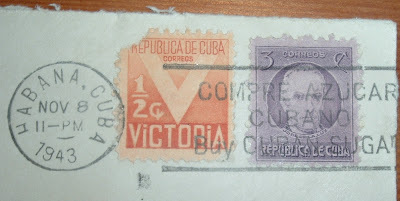 And there's an interesting cancellation to boot--COMPRE AZUCAR CUBANO with the English translation underneath: Buy CUBAN SUGAR. I can't find anything to indicate how long the Swan American Bookstore stayed in business, but there's no signs of life today, of course. If it was still in business when Castro came into power, I'm sure it didn't last long after that. 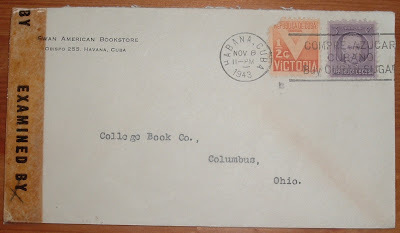 On the other hand, the addressee on the envelope--College Book Co. of Columbus, Ohio, is still around, though the last decade has seen them morph into a Barnes & Noble university bookstore. Their full name was Longs College Book Company and they were a publisher as well as a bookselling concern. In 2000, they were purchased by Campus Partners at Ohio State University. Under an agreement with Barnes & Noble College Booksellers, Long's was combined with the University Bookstore. Maybe somewhere in the company archives, if Barnes & Noble didn't trash them, there is a letter--my cover's contents-- that a World War II era censor read and then sent on to the bookstore in Columbus, Ohio. It would be interesting to see it and see if it had been worth the bother of the censor's actions. Of course it wasn't. I was recently contacted by a Dutch collector of bookseller/bookbinder labels, or tickets about trading duplicates. Unfortunately, my collection is so small I didn't have any duplicates at present to trade. But anyone who does have duplicates and is interested in swapping for Dutch (and other) tickets, please contact me and I will forward your information. This person was kind enough to scan some examples and email to me, and is also mailing me some to include in my collection. How nice is that?! As soon as I acquire some duplicates, they are headed across the Atlantic for the Netherlands. Meanwhile, I have permission to share some fine examples from my newfound fellow collector. Enjoy this Dutch treat!